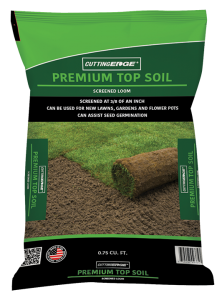 Cutting Edge® Premium Topsoil (Loam) is screened at 3/8”, and is a nutrient-rich soil which can enhance drainage and aeration. Our Topsoil can be used for new lawns, gardens and flower pots, and can assist in seed germination, reducing soil compaction and attracting desirable soil micro-organisms and essential elements needed for lawn and plant growth. It can also retain moisture and maintain a more even temperature of the soil, making it a top choice for new lawns, raised garden beds and flower pots. Cutting Edge® Premium Topsoil is perfect for commercial and residential use and can reduce drought damage to lawns and plants and decrease water evaporation. Our unique UV and water-resistant, non-slip packaging can provide extra protection for outdoor storage and can provide a nutrient-rich soil year after year. Available in 0.75 Cu. Ft. Bags!